4ft High Curved Pop up trade show table top backdrop with custom graphics, metal frame, rolling trolley, and spotlight. Easy assembly. Our portable graphic mural trade show booth displays with lightweight metal pop up frames are a convenient and great way to display large eye-catching graphics at trade shows. The high resolution panels are custom printed according to your provided artwork and have a laminated finish that protects the print surface and adds durability for multiple packs and un-packs. 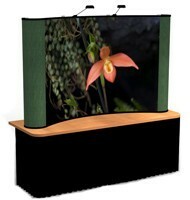 Set up is extremely easy as the frame unfolds to pop out to the display’s full size. Then the graphics panels use their attached magnetic strips to securely attach to the frame for a great professional look. Our popup trade show displays include a sturdy rolling case with built in wheels for easy transport of your materials. Floodlights are also included to increase the visibility of the display. Extra lights can also be ordered.